Have You Been Injured in a New Jersey Construction Accident? Construction sites can be very dangerous places to work and on-site accidents result in literally thousands of injuries and fatalities each year – and that’s just in the United States. That’s why construction workers account for approximately one in five workplace fatalities in this country. Often, these incidents are the result of negligence on the part of the construction company. Safety engineers and safety management programs should prevent these incidents. When they’re negligent or absent, accidents occur. Regardless of what caused a construction accident, the affected employee is entitled to some degree of compensation. If you or a loved one works in the construction industry in New Jersey and has suffered due to someone else’s negligence, contact a New Jersey construction accident lawyer. You want to know that the person helping you pursue fair compensation is thoroughly familiar with all applicable state laws. As per the Workers Compensation Act (WCA), employees who were injured even as a result of their own actions may still be entitled to compensation. Injured workers commonly receive benefits like weekly payments and coverage for medical expenses. Unfortunately, these benefits often fail to address the full extent of pain and suffering an individual may experience as a result of construction accident. Medical payments only cover treatments that have been deemed necessary, and weekly payments are calculated by assessing both the employee’s weekly earnings and the severity of the disability, whether it be a temporary total disability or a permanent partial disability. To ensure you get the reimbursement you deserve, you should contact a New Jersey construction accident attorney. 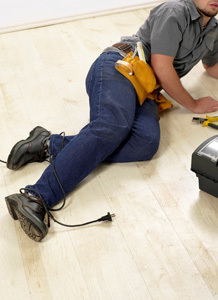 Typically, construction workers can’t sue their employers when injured on the job. However, there may be a third party responsible for the incident. There are circumstances in which liability in a workplace construction site accident can be assigned to a third party. To prove this, it helps to have the assistance of an experienced construction accident lawyer. Companies that manufacture equipment used at construction sites are responsible for designing and maintaining safe products. It’s not uncommon for construction accidents to occur because a product was defective or dangerous. While it’s always dangerous to use some equipment, the risk of injury increases when proper safety measures aren’t taken. A manufacturer may be found responsible if their product resulted in death or injury. Consulting with a skilled construction accident lawyer in New Jersey can be the key to proving this liability. If you’re looking for a New Jersey construction accident attorney, contact The Rothenberg Law Firm LLP at 1-800-624-8888 or submit an InjuryLawyer.com free online case evaluation. An experienced construction accident attorney will review your case. The initial case evaluation with a New Jersey construction accident lawyer is FREE. If we take your case, our team will work diligently to ensure you get the compensation you deserve. We don’t charge any legal fees unless we succeed in getting you money. Keep in mind, due to the Statute of Limitations, you may have to file a lawsuit before an expiration date, otherwise you could forfeit your right to compensation. That’s why it’s important to get in touch with a construction accident lawyer right away to discuss your case. "The Rothenberg Law Firm explained all aspect of the case and laws in NY and NJ so I was able to understand exactly what was needed and what can happen. I had complete confidence in them. Their lawyers are very smart, quick, and sympathetic to my loss."